Long time, no write! Not long time no bake, though. I was having some website issues but they have been solved (for now). The first thing I made after the Passover cupcakes was a recipe partially of my own creation, but I have dubbed them Version 1, so I’m not sharing them yet. However, Version 1 did land me my second paying job! I’m going to make Version 2 before the for-pay cupcakes need to be done, so we’ll see if the payee likes my improvements. About a month ago, before I started the blog, I made brownies that required white chocolate chips. Of course, I didn’t use the whole bag, so I needed another recipe to use the rest. And I remembered these cookies my mom made sometimes when I was a kid. I used to call them by the descriptive name of White Chocolate Chocolate Chip cookies. Apparently the recipe my mom used was from the Nestle bag, but I found a recipe from Sally’s Baking Addiction. And I’m glad I did because these cookies (whose shorter name I have now appropriated from Sally as well) are SO much better than the ones I remember. They almost have a brownie-like quality to them. 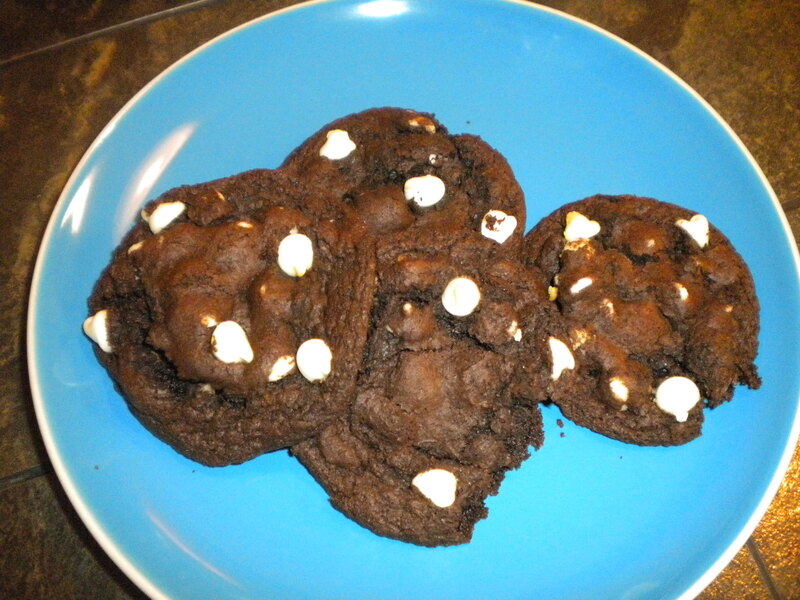 The only issue I had with this recipe is that creating the actual cookies turns your hands to chocolate. The blog says, “Your hands will get chocolate on them.” Let me tell you, that is a VAST understatement. My palms looked like they were made of chocolate. On a slightly different topic, I ordered professional baker boxes to put my goodies in when someone pays for them! I’m super excited to use them!